A trip into Wales for Everything Dinosaur this morning as one of the team members had been invited to visit Forden Church in Wales School to conduct dinosaur themed workshops with the Foundation children and a mixed class of Year 1 and Year 2. The children had prepared lots of questions and our fossil expert did his best to answer them all. The extra resources that he had brought with him went down well with the dedicated and enthusiastic teaching team, especially the dinosaur name pronunciation guide. A number of challenges were set, with one special challenge for the mixed Year 3 and Year 4 class, could they compose a letter to Everything Dinosaur and if they did, could they think of a question that would stump our dinosaur experts? The children even illustrated their letters with some wonderful prehistoric animal drawings. The children illustrated their letters with some wonderful prehistoric animal drawings. Ffion and Aimi drew dinosaur footprints and they both wanted to know about dinosaur teeth. Aimi asked do all types of dinosaurs have fierce teeth? Her query ties in with a question sent in by Matthew who enquired how many dinosaur herbivores were there? Ffion asked do all types of dinosaurs have special teeth? The mouths of dinosaurs were adapted to help them eat the food that the ate. Some dinosaurs, such as most of the meat-eaters, had teeth that were sharp and fierce looking, whilst many of the herbivorous dinosaurs such as Triceratops had rows and rows of square and blocky shaped teeth, ideal for grinding up plants. Some dinosaurs did not have any teeth at all. About two-thirds of all the dinosaurs described so far were plant eaters. Matthew Wanted to Know How Many Herbivorous Dinosaurs Were There? Proportion of plant-eaters to meat-eaters in the Dinosauria. In an email sent to Mrs Davies, one of the teachers, we were able to answer questions from Dan, Bethany and Nicky. Ryan had wanted to know what the name Tyrannosaurus rex means, we challenged the class to be “dinosaur detectives” and to conduct some research to find out for themselves. How Many Pterodactyls Were There? Wayne wanted to know how many Pterodactyls were there? This tied in with a question asked during one of our dinosaur workshops. The correct term for these flying reptiles is Pterosaurs and so far, something like 120 different types of Pterosaur have been named. The children were surprised to learn that the biggest Pterosaurs were taller than giraffes. Ben wanted to know how many fossils we had found? Ben asked about the number of fossils we had found. Everything Dinosaur team members are really lucky and they get to go on lots of fossil hunts. They have found thousands of fossils, some of which we keep and store in our warehouse so we can learn more about prehistoric life. When Did the Dinosaurs Live? Marine reptiles used to illustrate a letter with questions about dinosaurs. Zak asked when did the dinosaurs live? The timeline we provided along with the other extension resources should help Zak to answer this one. He also asked why are dinosaurs called reptiles? Dinosaurs make up part of a group of animals called reptiles, there are many different types of reptile living today. We sent a word game over to the school via email, can the children fill in the blanks and work out the names of reptiles alive today? Our thanks to all the children and their teachers at Forden Church in Wales School. We shall pin up these very colourful letters onto one of the walls in our office. Dinosaur fans and model collectors have been praising the Rebor range of 1:35 scale replicas ever since their introduction more than two years ago. At Everything Dinosaur, we regularly receive emails from collectors who have written to say how much they admire a particular model. Take for example, this missive we received from “Paleo Paul” regarding the Rebor Acrocanthosaurus atokensis model that he had recently purchased. A great dinosaur model by Rebor (Acrocanthosaurus atokensis). Team members at Everything Dinosaur enjoy receiving feedback from customers and we read every review and email that we receive. It is always fun to read what discerning dinosaur fans think about their purchases. It’s nice to know that are work is appreciated. Wonderful detail on the Rebor Acrocanthosaurus model. Everything Dinosaur has published a total of 1,492 customer reviews on its website over the last three years. A total of forty-six reviews for the Rebor range of models and replicas have been received so far. Given the popularity of Rebor models a spokesperson for Everything Dinosaur stated that it was likely that Rebor would pass the half century mark for customer reviews before the entire site reached the landmark total of fifteen hundred. “The prey item accessory” referred to in the Acrocanthosaurus model review by Paleo Paul is the head, neck and partial torso of a Tenontosaurus, a contemporary of A. atokensis and it is quite likely that this large carnivore did indeed hunt and eat Tenontosaurus. Recently, Rebor introduced the second element of the Acrocanthosaurus diorama, the rest of the Tenontosaurus corpse. The Rebor Tenontosaurus links with the Rebor Acrocanthosaurus replica. The Tenontosaurus replica “Ceryneian Hind” – from the labours of Hercules, has already received rave reviews of its own. A third element to make this diorama complete will shortly be available from Everything Dinosaur. A team of international scientists including researchers from Bristol University, have published research on two specimens of 99 million-year-old amber from Myanmar (called burmite), which have revealed the preserved remains of two tiny, baby birds. The scientists conclude that these birds were active shortly after hatching (precocial) and that sadly they met their demise when they became trapped in sticky tree resin. The remains of the wing can be clearly made out trapped in the amber. The photograph above shows a close up of the feathers preserved in one of the burmite specimens. The researchers led by Dr. Xing Lida (China University of Geosciences), along with colleagues from the USA, Canada and Professor Mike Benton from the School of Earth Sciences (Bristol University), have identified three long fingers, each tipped by a sharp and strongly curved claw, one of which can be seen in the top right of the picture above. Amber fossils from Myanmar (formerly called Burma), have provided palaeontologists with a fascinating insight into life in the primordial forests of the Cretaceous. In the spring, Everything Dinosaur published two articles regarding remarkable fossil discoveries which had only been possible due to fossil finds within burmite. In one article, we reported on the potential origins of the malaria parasite, in the second we provided information regarding the discovery of the fossilised remains of tiny lizards. Although Burmese amber has produced fossils of isolated feathers, this is the first time in which portions of birds have been discovered. Pieces of skin and parts of an ancient wing preserved in amber. The fossil wings are very small, between two and three centimetres long. the long, bony fingers can be made out along with the three digits on each wing. The anatomy of the hand has allowed the scientists to identify these as members of the Enantiornithines (Enantiornithes), group of birds, a diverse clade of toothed birds that possessed prominent wing claws. The Enantiornithines, thrived during the Cretaceous and some eighty species have been named, although a number are only known from single bones. These birds became extinct at the end of the Cretaceous and they are thought not to have been very closely related to modern Aves (Neornithes). Tiny details on the feathers have been preserved. Ultra violet light and X-rays were used to analyse the fossil material. The two specimens have been nicknamed “Rose” and “Angel Wings”. After careful polishing, the fossils were analysed using white light, UV light and powerful X-rays. The scientists conclude that the birds, although babies were highly mobile. This indicates that these birds were very well developed when they hatched and capable of being independent from their parents. Sadly, their mobility seems to have been their downfall. As the clambered around the branches and trunks of trees they became trapped in sticky tree resin. Larger animals would have had the strength to pull free, but these youngsters were doomed. The amber even preserves claw marks and scratches as the birds tried to pull themselves free. Preserved in amber the wings of baby birds that once became trapped in tree resin. The beautiful illustration above shows an imagined scene in which one of these young birds find itself trapped and unable to break free of the glue-like tree resin. Different pigments in the feathers can be made out quite clearly in this feather preserved in Burmese amber. Fine details of the fossilised feather can be clearly seen in the amber. Everything Dinosaur acknowledges the help of Bristol University in the compilation of this article. The scientific paper from which this article is drawn: “Mummified precocial bird wings in mid-Cretaceous Burmese amber” by Lida Xing, Ryan C. McKellar, Min Wang, Ming Bai, Jingmai K. O’Connor, Michael J. Benton, Jianping Zhang, Yan Wang, Kuowei Tseng, Martin G. Lockley, Gang Li, Weiwei Zhang and Xing Xu. Over the last few days a number of articles have been published detailing the research of scientists from the University of Alberta and the National Eye Institute of the United States who have been studying the light detecting photoreceptors in the retinas of mammals. It turns out that night-time vision, an ability to see in very low light levels, evolved millions of years ago in early mammals during the Jurassic. Many of these articles have emphasised the possibility that night vision evolved to help the mammals adjust to a nocturnal lifestyle in order to avoid the dinosaurs that dominated during the day. However, the real significance of the research might be a unique genetic ability in mammals to transform some types of light receptors in the eye. This could have huge implications when it comes to restoring sight in people with damaged eyes. Sabre-Toothed Mammal that lived amongst Dinosaurs. Mammalian eyes are complex organs. Light enters the eye through the cornea, passes through the pupil and into the lens, where it is focused and then directed back to photo sensitive cells that line the retina at the back of the eye. These light sensitive cells covert the light into electrical signals that are carried to the brain by optic nerves and the brain then decodes them and provides vision. The retina contains two main types of distinctive photoreceptor cells – the rods and cones. Rods are thinner than the cones and they are distributed differently across the retina, but the chemical process in each that supports the interpretation of light to electrical signals is very similar. Rods – are sensitive to low light levels making then highly suited for night vision. Cones – are less sensitive and not capable of operating effectively in low light but they are much better at being able to pick up broader wavelengths of light across the colour spectrum and therefore they are responsible for colour vision and image resolution in bright light. Helping to work out the photoreceptor layout of the mammalian eye. When the structure of rods and cones are compared, it would appear that the rods are the more primitive and ancient of the two types of light sensitive cell, but this is not the case. Researchers have long suspected that the light detecting cone cells came first and the rods evolved later. In the study of the retinas of mice, the researchers found evidence to support the idea of a cone to rod transition. They found the vestiges of short-wave cones (those responsible for detecting the shorter wave lengths in the visual light spectrum, the blues and violets), in developing rod photosensitive cells. This would confirm the idea that had persisted for decades that there was a cone-to-rod transition, that the cones came first. When the scientists looked at zebrafish, a member of the most ancient of all the vertebrate lineages, the fish, they found that there was no evidence for short wave cones having converted into rods. In zebrafish rods did not show any signs of having developed from cones. The discovery that mice have the ability to convert some types of cone cell into rods is significant in itself, the lack of this feature in zebrafish has helped the researchers solve a seventy-year-old evolutionary puzzle. If cones provide colour vision and rods vision in low light, it would be reasonable to assume that diurnal (daytime functioning) animals would have a cone cell dominated retina to provide them with optimal daytime vision. However, studies of mammalian evolution have shown that mammals have a rod dominated retina, better suited for vision at night or a very low light levels, even with diurnal species like H. sapiens. In humans we have something like 20 rod cells for every 1 cone cell in our retina. Evolutionary biologists have traced the origins of a rod dominated mammalian retina to the Late Jurassic and referred to as the “nocturnal bottleneck theory”. This theory suggests that many mammalian traits such as excellent hearing, a good sense of smell, a rod cell dominated retina, whiskers and a highly developed sense of touch can be explained by the fact that mammals were confined to the dark, poorly lit undergrowth or to a nocturnal existence, so long as the terrestrial reptiles, most notably the dinosaurs, existed. It was only with the extinction of the non-avian dinosaurs at the end of the Cretaceous that led to mammals diversifying to occupy diurnal niches in ecosystems. Even today, the majority of the 8,000 species of mammals on our planet are nocturnal. Recently, the idea that the mammals were restricted to only a few niches and that they were relatively small has been challenged as new fossil finds suggest that during the Cretaceous the mammals were much more diverse and speciose then previously thought. PhD student Phil Oel and his supervisor Associate Professor Ted Allison. Those mammals that were best able to exploit the nocturnal way of life, were the ones that survived, going on to radiate and diversify and eventually, after the dinosaur extinction, replacing the Dinosauria as the dominant terrestrial megafauna. One intriguing question remained, if the mammals were somehow able to produce extra rod cells to help with night-time vision, then where did they come from? The findings not only have important implications for evolutionary biologists, but this new understanding may have clinical applications in the future. If mammals have a way of converting cone photoreceptors to rod cells then it may be possible to apply this research to help develop ways of restoring vision in humans. Earlier this month, a member of the Everything Dinosaur team visited Abercrombie Primary School in Chesterfield (Derbyshire), as part of two days of science study with Year 2, 3, 4, 5 and Year 6. Over the course of the workshops we conducted, we set a number of challenges for the classes. One challenge was to have the children “design their very own prehistoric animal”, with a new dinosaur species being named, on average, every three weeks or so, there is plenty of scope for new dinosaurs. Another challenge involved the children writing Everything Dinosaur a thank you letter, from our bulging mail bag on Friday, it looks like lots of the pupils at the school took up the opportunity to send in examples of their work. Pupils from Abercrombie Primary sent in dinosaur drawings. Our thanks to Henry, Daisy, Frasier, Sophie, Ebony, Daisy, Reuben, Lucy, Daniel, Ibrahim, Alfie, Holly, Noah and all the other children who sent in super prehistoric animal drawings, they are certainly very colourful. The children have thought very carefully about their prehistoric animal designs, considering where the animal might live, what it might eat and how it would keep itself safe. A very colourful dinosaur drawing by Henry. We enjoyed looking at all the prehistoric animal pictures that had been sent into us by the children. Some of the dinosaur names the children had invented were very creative such as “Hungry eater steeler” from Leo and we even had a drawing of Indominus rex from the film Jurassic World. The hand-writing challenge involved composing a thank you letter to Everything Dinosaur and sure enough we received a set of beautiful and well written thank you letters, some of which had even been illustrated. Pupils sent in thank you letters to Everything Dinosaur. Our thanks to Ali, Dexter, Oliver, Libby, Alice (yes, you are quite right fossils are usually found in sandstone and limestone), Erin and Harry (wonderful dinosaur skull drawing). Isobel wanted to know how long have we been looking for fossils? Everything Dinosaur team members found their first fossils when they were not much older than Georgia or Felix. Louie wrote to say that he was sorry to have missed all the dinosaurs as he had been ill but he did send in a nice letter and even took the trouble to draw some dinosaur eggs. A thank you letter from a pupil at Abercrombie Primary. The question was asked, how do you get fossils? Fossil can be found in lots of places but most fossils are found in rocks and one of the best places to find them is at the seaside. Arthur wrote in to say that his favourite part was holding the Tyrannosaurus rex tooth and he also liked the stickers we gave him. A special thank you to all the children at Abercrombie Primary who sent in letters and pictures. Back in December 2015, a routine drain excavation taking place north of Mexico City was halted when the fossilised remains of a giant Woolly Mammoth were uncovered. Such finds are relatively common in this part of Mexico, a number of specimens of the Columbian Mammoth (Mammuthus columbi) have been discovered in recent years as the metropolitan area of Mexico has expanded. The Columbian Mammoth roamed much of North America during the Pleistocene Epoch, its fossils have been found over most parts of the United States and it has been recorded as far south as Costa Rica. Scientists from the National Institute of Anthropology and History (Instituto Nacional de Antropología e Historia), in Mexico, have been working to excavate the fossils including an exquisitely preserved skull with two-metre long tusks. The Columbian Mammoth fossils found near Mexico City being prepared for removal from the dig site. This Mammoth is believed to have died around 14,000 years ago, when it became bogged down in mud surrounding a shallow lake. Around fifty individuals have been found around Mexico City, it seems that these large elephants (Columbian Mammoths were considerably bigger than their more famous counterparts, the Woolly Mammoth, M. primigenius), were prone to getting stuck in mud, the site where the remains were found, near the village of Tultepec was once covered by a shallow lake, animals were attracted to this area and occasionally a Mammoth would have become stuck in the mud that surrounded the water. Field team members working to remove the bones have suggested that the scattered remains may indicate that the carcase was butchered by humans for meat. However, Everything Dinosaur team members have not been informed of the discovery of any tell-tale cut marks found on the bones. The carcase could have become scattered as a result of other animals trampling the bones. Remains of a Columbian Mammoth found near Mexico City. Back in 2009, Everything Dinosaur reported on the opening of a major exhibit at Waco in Texas which provided members of the public access to a Columbian Mammoth dig site where the remains of more than a dozen of these elephants had been discovered. Commenting on the discovery, archaeologist Luis Cordoba from the National Institute of Anthropology and History explained that these fossils were found some two metres below ground and they represent an animal that would have been between 20 and 25 years of age when it died. The skeleton, although disarticulated is almost complete and it is in a remarkable state of preservation. It is hoped that the specimen will be able to go on display to the public once it has been fully prepared. Luis Cordoba holding a dorsal vertebra from a Columbian Mammoth. It is likely that the Columbian Mammoth is descended from the Steppe Mammoth (M. trogontherii). Mammoths crossed the Bering Straits land bridge (Beringia), entering the New World from Asia around 1.5 million years ago. The very last of these Mammoths may have lived as recently as 11,000 years ago. It is not known what role human hunting played in their extinction. The talented people at JurassicCollectables have made a video review of the new for 2016 Papo feathered Velociraptor dinosaur model, for us this was the last of the 2016 models to arrive and it is certainly a case of last but not least as this is bound to be a big hit with feathered dinosaur replica fans. In the short video, it lasts a little over nine and a half minutes, the JurassicCollectables narrator reviews this new model and compares and contrasts this “raptor” with earlier Papo models. Papo have certainly done a great job of recreating “speedy thief”. Papo Velociraptor model size comparison. In this great video, the narrator gives a detailed review of this new for 2016 sculpt. It is compared with other Papo models and we really liked the description of that wide opening articulated jaw as a “butterfly jaw”, that’s a fantastic description. Look out for the CollectA Mosasaur model that can be seen at the end of the video. The picture above shows one of our studio shots of the new for 2016 Papo Feathered Velociraptor. JurassicCollectables comment extensively about this new replica and they stress how the skull of this replica more accurately reflects the skull fossils of the Velociraptor genus. The feathery coat is really well done and we too at Everything Dinosaur would like to congratulate the designers at Papo for making such a fascinating and intriguing replica. In Everything Dinosaur’s annual survey of the most popular prehistoric animal models, Velociraptor had climbed to number two in our chart. We suspect that this was because of the influence of the film “Jurassic World”, as Velociraptors play a significant part and perhaps have almost as much, if not more screen time than the Indominus rex. Scientists from Oxford University and the Departamento de Biología Molecular de Plantas, Instituto de Biotecnología, Universidad Nacional Autónoma de México (Mexico), have identified the oldest known population of plant root cells in a 320 million-year-old fossil. This study, published as an on line, open access article, highlights the importance of historical collections such as the Oxford University Herbaria, which as part of the University’s Plant Sciences Department, houses an extensive botany collection, with some specimens within the archive over 300 years old. A slide made over 100 years ago preserves evidence of fossilised root structures. The picture above shows a thin soil slice prepared on a slide over 100 years ago and part of the Oxford University Herbaria collection. The fossilised soil is estimated to be around 320 million-years-old and shows the cellular anatomy of plants which were growing and decaying in the fossil soil underlying the Carboniferous coal swamp forests. The scientists have not only revealed the oldest plant root stem cells found to date, the research also marks the first time an actively growing fossilised root has been discovered and it shows that plant root cell division in the past may have been more diverse than today. The roots and shoots of plants develop from specialised groups of cells called meristems. These self renew and produce cells that undergo differentiation. The organisation of these cells changes when growth stops, so up until this research was published, it was impossible to compare the fossil record with the cellular structure of actively growing meristems. Using slides from the Oxford University Herbaria that represent thin sections of fossilised soils taken from Carboniferous coal balls, researchers were able to identify the fossilised remains of an actively growing root meristem and examine in detail the stem cells and their structure. They found that the cellular organisation of the fossilised root tip is unique. Roots and shoots of ancient plants from the Carboniferous may have grown in a broadly similar way to modern plants such as the angiosperms (flowering plants), but the unique cellular order and structure demonstrates that the meristem growth we find today may only represent a proportion of the root and shoot growth diversity that once existed. This research indicates that some of the biological processes and systems controlling the root development of plants have now become extinct. The dark horseshoe-shaped structure is the root cap protecting the growing root apex as it pushes through the soil. The structures preserved in the fossil record are similar to those found in extant species, but they are different, they represent a unique cellular arrangement not known in modern plants. The fossil soil slides and the root structures they contain are extremely important as they provide a record of our planet’s first global tropical wetland forests. The Carboniferous swamps and wetlands were to form the extensive coal deposits found in much of the world today, including most of the coal in the United Kingdom, exploitation of which fuelled the industrial revolution. From a biological point of view, these huge, lycopsid (club mosses), pteridosperm (seed fern) and sphenopsid (horsetails) dominated forests represent the first time deep rooting structures evolved on Earth. These root systems increased the rate of chemical weathering of the silicate minerals in rocks, a chemical reaction that pulled carbon dioxide out of the atmosphere, leading to a period of global cooling – climate change on a worldwide scale. Of the 139 slides studied, two root caps were identified. The first was assigned to a known species Lyginopteris oldhamia, a seed fern (pteridosperm), the second was an unknown species, this has been named Radix carbonica, this translates as “coal root”. Fossilised root structure preserves record of ancient root growth. From examining the size and number of cells which radiate out from the tip the researchers were able to establish that the root was actively growing at the time it was fossilised. This makes the finding the first and only discovery to date of the fossilised remains of an actively growing root meristem. The schematic diagram below shows the cellular organisation of a typical member of the gymnosperm group (conifers, ginkgos and cycads). The colours show various major tissue types within the meristem. New study suggests different types of root growth in plants took place in the past. The diagram above shows (A and C) the meristem of a typical gymnosperm, compared with (B and D) the meristem of Radix carbonica. A simplified cladogram showing the hypothesised origin of roots based on this new study (E). The meristems of different types of lycopsids are compared to the evolution of ferns, gymnosperms and the path towards the flowing plants (angiosperms), that evolved later. Everything Dinosaur acknowledges the help of a press release from the press team at Oxford University in the compilation of this article. Those clever people at JurassicCollectables have just published a video unboxing and review of the Rebor Compsognathus model “Sentry”. In this informative five minute video, the Compsognathus replica and the accompanying dragonfly model (Protolindenia) are reviewed in turn and then a number of other Rebor replicas are featured demonstrating how many of the Rebor models can be customised to make intriguing dioramas. The narrator compares this 1:6 scale replica of this Jurassic dinosaur to the compsognathids that were depicted in the second of the Jurassic Park movies “The Lost World”, which came out in 1997 and was the second highest grossing movie that year behind Titanic. In the film, the small but agile compsognathids are social animals that live in a flock and they attack a young girl before gaining even more notoriety by fatally attacking one of the InGen team members Dieter Stark, played by Peter Stormare. It seems that in the “Lost World” even tiny dinosaurs can be extremely dangerous when they are hungry. One of the compsognathid dinosaurs from “The Lost World” film (1997). The compsognathids from the film have certainly inspired the model makers at Rebor. Their compsognathids “Sentry” and the four model set “Bad Company” due to be reviewed by JurassicCollectables shortly, are very similar to those seen in the movie. In the video review, the narrator points out several similarities and there is much to be admired about this Rebor 1:6 scale replica. One of the amazing Compsognathus models from Rebor available from Everything Dinosaur. JurassicCollectables show a number of ways in which components from “Sentry” can be combined with other replicas in the Rebor range. Elements from “Sentry” are shown with “Melon”, the baby Stegosaurus in the Scout series as well as with the Dimorphodon pair (Punch and Judy) and the base from the “Savage” Ceratosaurus 1:35 scale model. Both the JurassicCollectables YouTube channel and the Rebor replicas are highly recommended. A busy morning for Everything Dinosaur, as one of their team members made a return visit to Thorpe Hesley Primary (Rotherham, south Yorkshire), to work with the two classes of Year 1 children who have been spending the summer term learning all about dinosaurs. 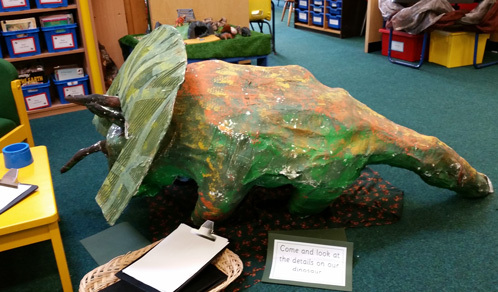 This is a topic that the children in previous years have covered, one of the classrooms had a wonderful paper mâché Triceratops on display. In the tidy and well appointed classrooms, the enthusiastic teaching team had been preparing a range of very creative activities for the budding palaeontologists to try on their special dinosaur day. Our workshops aimed to reinforce learning as well as to introduce different types of dinosaurs to the children. Could they remember all the dinosaur facts? The children in Class 1 and Class 2 (Key Stage 1), had the opportunity to handle fossils and their super quick reactions ensured that both classes won some dinosaur stickers. We look forward to seeing how the pupils got on with the “design a dinosaur challenge” that we set them, can they label all the body parts including the skull? We noted that an area of one classroom had been set aside so that a special dinosaur museum could be created, we think this would be a great place to exhibit some of the children’s prehistoric animal themed work. We looked at herbivores and carnivores and explored how many Year 1 children could fit inside the tummy of a really big dinosaur. In addition, the extra resources our dinosaur expert provided should help the children gain confidence with numbers as a couple of the extension exercises involve measuring and counting. We even spotted some dinosaurs in the play area used by the Nursery. Our dinosaur expert felt quite at home with all the dinosaurs and prehistoric animal themed displays at the school. A triangle shape filled with dinosaurs. That is a lovely group of plant-eating dinosaurs, can the children name them? Sadly, all too soon our time was up and it was lunch. The children had lots of questions and we did not have time to answer them all, so with the permission of the teaching team we challenged the children to write us a thank you letter and if they did, they could include a question if they wanted. We made a “pinkie palaeontologist” promise to read them all. As the summer term progresses, soon it will be time for sports day, we sported some equipment close by to the well-stocked resources cupboard and we wondered could the children be using dinosaur eggs for the egg and spoon race? Could the Children Use Dinosaur Eggs for the Egg and Spoon Race? Dinosaur eggs for the egg and spoon race? Glad we were able to help the children explore prehistoric animals with a dinosaur themed workshop.